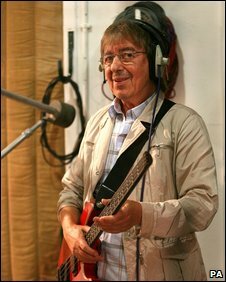 Former Rolling Stones star Bill Wyman has expressed concern that music games like Rock Band stop young people from practising real musical instruments. He told the BBC: "It encourages kids not to learn, that's the trouble. "It makes less and less people dedicated to really get down and learn an instrument. I think is a pity so I'm not really keen on that kind of stuff." Wyman was speaking at Abbey Road studios while recording a charity Beatles song for Children in Need. 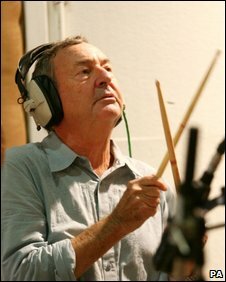 His words were echoed by Pink Floyd star Nick Mason who described music games like Rock Band and Guitar Hero as "interesting new developments". But he added: "It irritates me having watched my kids do it - if they spent as much time practising the guitar as learning how to press the buttons they'd be damn good by now." The rock legends were speaking just ahead of the launch of The Beatles: Rock Band game which features 45 re-mastered songs from the Beatles' back catalogue. 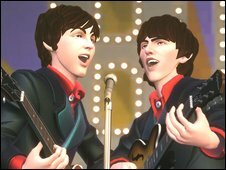 The game allows players to play along as The Beatles through their career in environments such as The Cavern Club and the Shea Stadium. Alex Rigopulos, co-founder of Harmonix Music Systems, which created the Rock Band series, refuted the musicians' claims. "Most people try to learn an instrument at some point in their lives, and almost all of them quit after a few months or a year or two," he told the BBC. "This, I think, is because the earliest years of learning an instrument are the least gratifying. "When people play Rock Band, however, they very quickly get a glimpse of the rewards that lie on the other side of the wall. "We're constantly hearing from fans who were inspired by Rock Band to start studying a real instrument." Paul DeGooyer, from Rock Band publishers MTV Games, added: "It is gratifying to be a part of a revival of interest in music education at a time when budgetary challenges are causing many school music programs to be cut." Mason said that Pink Floyd has not ruled out working on a Rock Band or Guitar Hero-style game in the future. "I think we'd consider it," he told the BBC. "I think everyone's looking at new ways of selling the music because the business of selling records has almost disappeared. "I'm of the old guard who are really sad about that, because I always liked the concept of the album - rather than just cherry-picking tracks - and also the business of the art work that went with it." He added that any new material from Pink Floyd was "very unlikely". "We're all still interested in the catalogue and trying to make the most of it, re-mastering when necessary, and looking at other things that we could do with it," Mason added. "I think we're all still very proud of it - we do talk to each other occasionally."